THE AMAZING LOOP at Chambatta, India, on the Darjeeling Himalayan Railway. As the line had to overcome an ascent of 7,000 ft in less than fifty miles, severe gradients and sharp curves were found to be necessary. The railway, opened in 1880-81, operates a service between Siliguri, the lower terminus, and Darjeeling on the slopes of the Himalayas. THE Darjeeling Himalayan Railway is one of the engineering feats of the world. Although the steepness of the gradients on this narrow-gauge line is eclipsed in other parts of the world, and the 7,407 ft altitude of the summit at Ghoom station is less than half the height of some of the summits described on the page, “The Magic of the Andes”. The achievement of the engineers who built the line more than half a century ago is a noteworthy one in the history of railways. This little railway has a gauge of 2 ft and a length of fifty-one miles, with steep gradients and amazing loops. It climbs from the plains - which are most oppressive in the hot weather - to the coolness of the “hills”, as British residents in India call the lower slopes of the Himalayas on which are situated the towns, or “stations”, to which they go periodically to preserve their health. At one time the journey from Calcutta to Darjeeling was an exhausting one involving many changes. The passenger went by train to Sahebgunge, 219 miles distant. Here a bullock cart had to be taken to the River Ganges, at a point opposite Dingra Ghat. After the river was crossed, by means of a steam ferry, to Carragola, another bullock cart journey ensued to Purneah and Siliguri, over a hundred miles from Sahebgunge. At Siliguri the ascent began to Darjeeling. The whole journey took from five to six days. In 1878 the Northern Bengal State Railway was opened, reducing the time of the journey to less than twenty-four hours. The mail train from Calcutta left the terminus of the Eastern Bengal State Railway and ran 116 miles to Damookdeah, on the Ganges, where passengers and mails were taken across the river by ferry steamer to Sara Ghat, on the northern bank. From Sara Ghat the railway went on to Siliguri, a distance of 196 miles. In those days dinner - the fish course of which was “strongly recommended” - was served aboard the ferry, and the vagaries of the great river made the crossing interesting. Since the river was constantly cutting away the bank at one place and increasing it at another, the points of departure on one side and of arrival on the other had frequently to be altered, sometimes by as much as several miles. As an aid to navigation of the ferry steamer at night, small boats were moored in the river, showing coloured lights. In after years the Ganges was bridged to carry the line from Calcutta to Siliguri, and the Eastern Bengal State Railway now operates the territory formerly served by the Northern line. The Hardinge Bridge, which spans the river, was opened in 1917, connecting the 5 ft 6-in gauge lines of the system south of the Ganges with the metre gauge lines on the northern bank. It comprises fifteen girder spans of 345 ft 1½-in, with three land spans of 75 ft at either end. NEAR TINDHARIA. The station at the third loop on the railway, sixteen miles from Siliguri. The complete loop is shown in this striking illustration. The sharpest curve on the line has a radius of 69½ ft. It is at Siliguri that the Darjeeling Himalayan Railway begins its remarkable journey to Darjeeling. 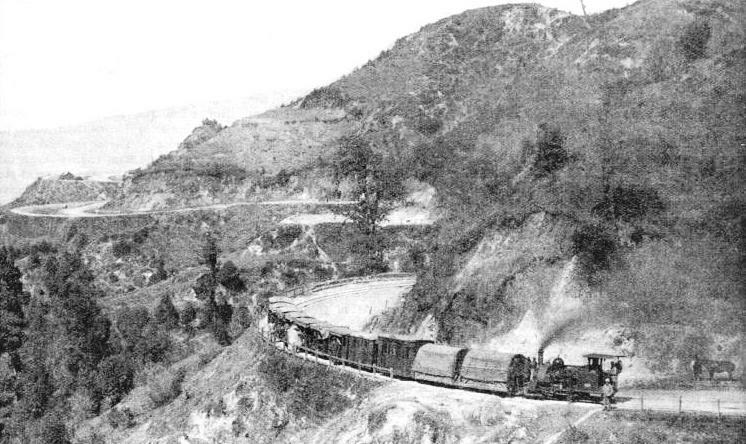 Before the railway was built, a first-class road, built by the Government at a cost of £6,000 a mile, wound upwards to Darjeeling. In March, 1878, a scheme for the construction of the railway was drawn up, and estimates and plans were submitted to the Lieutenant-Governor of Bengal, who gave it his support. The money for the enterprise was subscribed almost entirely in India. The Government undertook to maintain the cart-road, the route of which was to be followed by the railway, and guaranteed that the gross receipts of the railway should not fall below a certain figure. The cart-road, about forty miles long, some 25 ft wide, and metalled throughout, was used by pack ponies, pack bullocks, bullock carts, palkee gharries, and pony tongas. The construction of the railway considerably reduced the cost of fares and transport, and made the benefits of a “hill climate” available to the poorer European who had to work and live on the plains of Bengal. The building of the railway aroused great interest in India. Work began in May, 1879, and in March, 1880, the Viceroy of India, Lord Lytton, travelled on a train as far as the eighteenth mile, which was then the limit of the line. In the following August the line was opened for passenger and goods traffic as far as Kurseong, 4,864 ft above the sea and thirty-two miles from Siliguri. 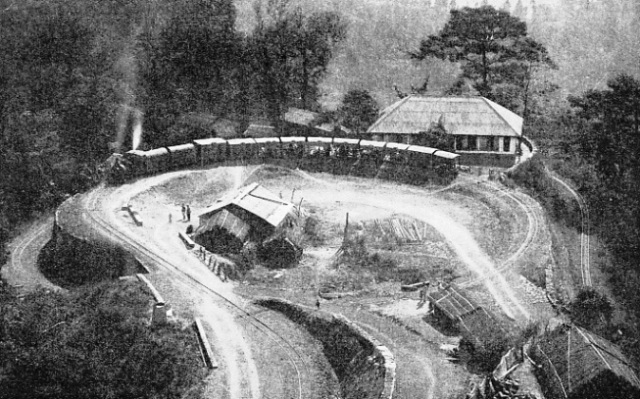 In July, 1881, the line was opened throughout to Darjeeling station. Siliguri lies 398 ft above sea-level. The summit at Ghoom, forty-seven miles from Siliguri, has an altitude of 7,407 ft, that of Darjeeling being 6,812 ft. As the line had to rise over 7,000 ft in less than fifty miles, steep gradients and sharp curves were unavoidable. The surveyors plotted banks ranging from 1 in 19 to 1 in 36¾, and curves of 50 ft radius. Later, however, these were eased, the sharpest curve being 69½ ft, the steepest short gradient being 1 in 23, and the steepest average gradient about 1 in 29. The fact that it was decided to work the line by adhesion on the narrow gauge of 2 ft restricted the weight of the trains, but there is nothing of a “toy railway” about the construction of the line or about the amount of passenger and goods traffic that it carries. Steel rails weighing 41¼ lb per yard were laid on wooden sleepers. For the first seven miles from Siliguri station the gradient was easy, the ascent to Sookna station (533 ft) being at 1 in 281. The heaviest piece of work in this section was the erection of a steel bridge, 700 ft long, in seven 100-ft spans, across the Mahanuddy River. This river has its source in the line of mountains ahead of the traveller known as the Mahaldirum Range, with an altitude of about 7,000 ft. The river at this point forms a boundary between the Terai, the jungle tract at the foot of the Himalayas, and the district of Julpaiguri. It is a tributary of the Ganges. The train passes streams and tea gardens on the way to Sookna. When the jungle was being cleared the area was fatal to many Europeans, a number of whom died from fever. DIAGRAM OF LOOP No. 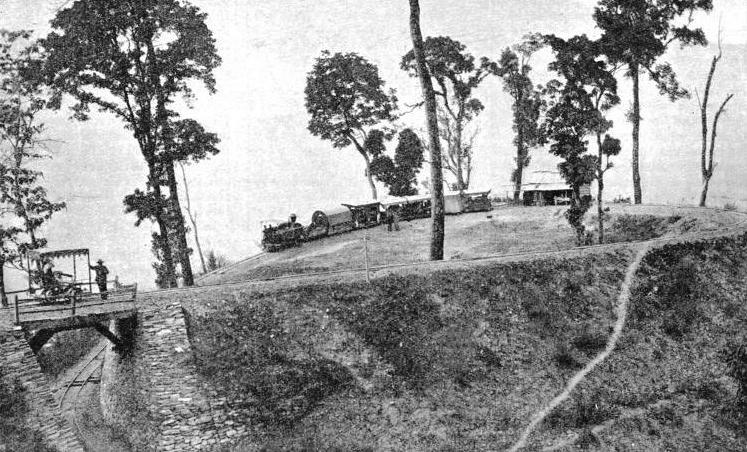 2 at the fourteenth mile on the Darjeeling Himalayan Railway. The gradient here is 1 in 28. It is at Sookna that the real ascent begins. After passing the ninth mile-post, the train encounters the first sharp curves. Then a fine view opens out to the south, displaying a vast horizon, and the passenger notices how rapidly he is rising above the plain. Passing through giant bamboos and screw-pines, the train reaches the first spiral, or loop. The engineers had to conquer an altitude of 871 ft in the four and three-quarter miles from Sookna to Rungtong station (1,404 ft), which is at the twelfth mile. Four and a half miles from Sookna the sudden ascent made a spiral unavoidable. The track described a sharp spiral through a deep cutting to gain the higher level. Four years or so after this had been constructed the rains of 1883 caused a slip of rocks and earth which fell into the cutting, completely filling it. This misfortune was turned to good account. The engineers had discussed re-aligning the section to reduce the gradient, and when the landslip compelled them to repair the line they eased the gradient, making a new track some distance below the original road. Soon after Rungtong station the line turns nearly south on to a long spur where another spiral is encountered. This spiral begins just before the fourteenth mile-post, and is one of the most complicated and interesting pieces of engineering on the railway. From Rungtong the line has to ascend to Tindharia station (2,822 ft) in less than eight miles, the average gradient for this section being 1 in 28¾. To overcome a sudden rise of 137 ft, there is practically a double loop, the outstanding feature of which is a sharp curvature introduced to fit the alinement to the situation. This second loop is a fine feat of engineering. The track, now returning northwards and eastwards for a short distance, runs along the old road, but gradually passes below it, until the third loop is reached at the sixteenth mile-post. Fine views are afforded of the valley below, the Bhutan Range to the eastward, and the adjacent hills and valleys. In the plains to the south-east can be seen the Teesta River, with an island called Tiger Island, because three tigers were once shot during one “beat” there. The river has its source in the Tibetan Lake Chalamu, which is 17,000 ft above sea-level, and about seventy-four miles north-east of Darjeeling. At the eighteenth mile the country presented such difficulties that a spiral was impracticable, and a reverse had to be adopted. At an altitude of 2,438 ft, the line, climbing at 1 in 28, enters a curve of 800 ft radius, followed by one of 400 ft radius, and reaches a dead-end at 2,473 ft. It then backs up a second leg, rising at 1 in 33 round curves of 400 ft and 200 ft radius respectively, to a second dead-end at 2,501 ft. Another climb at 1 in 28 round a curve of 400 ft radius brings the train to 2,536 ft, so that by means of the reverse or zigzag a total vertical lift of 98 ft is accomplished. A SECTION OF THE MOUNTAIN LINE showing the tortuous alignment. The railway has a 2 ft gauge, and although there are short gradients as steep as 1 in 23, the line is adhesion operated. Rolling-stock is on a small scale; the first-class carriages are only 13 ft long and 6 ft wide. The maximum speeds are 12 mph on the ascent and 9 mph on the descent. Tindharia station is considered to be above the Terai fever level. The workshops of the company are here. In the section of just under four miles between Tindharia and Gyabari stations the heaviest average gradient, 1 in 28¾, has to be faced. After a zigzag outside Tindharia station comes the fourth and final spiral or loop This is generally regarded as the most sensational spot on the line, and is called “Agony Point”. It represents the ascent of another of the conical spurs which are common in the locality. Originally there was so little room that on the upper part of the loop a curve of 59-½ ft. radius had to be described, the train practically overhanging the hillside at this point, but improvements were carried out later and the curve was somewhat eased. The train passes “Agony Point” and proceeds, encountering another zigzag just before Gyabari station. The station stands at an altitude of 3,516 ft. Just beyond it the fourth and last zigzag, or reverse, is negotiated, and the gradient becomes slightly easier, 1 in 32 for the succeeding four miles to Mahanuddy, 4,120 ft above sea-level and twenty-seven miles from Siliguri. In the gorges below, it is said that a Nepalese head-man in charge of men working on the road to Darjeeling shot a large Himalayan bear. As he had no lead for bullets, he used copper coins. A stream called the “Mad Torrent” marks the hall-way distance to Darjeeling. At the twenty-seventh mile the train passes a precipitous rock-face where the road was blasted out, in some places for a depth of 50 ft. Near Mahanuddy station is a waterfall with a drop of 150 ft, which is the source of the Mahanuddy River. The gradient eases to 1 in 32½, and the train proceeds westwards towards Kurseong station, which is at an altitude of 4,864 ft. Before the station is reached some bluff rocks are passed. The town is of some importance, and has a considerable trade. There are some splendid views of the plains from the heights near the town. After leaving Kurseong the grade stiffens slightly to 1 in 31 to Toong station, a distance of about five miles. After Toong the gradient increases to 1 in 29½ for the five miles to Sonada, 6,552 ft above the sea and forty-one miles from Siliguri. Then comes the easiest section of the mountain climb, about six miles long, to Ghoom, the summit, which is 7,407 ft above sea-level, and forty-seven miles from Siliguri. The gradient cases to 1 in 36¾, and the line passes through magnificent forests. It is now only about four miles to Darjeeling, the altitude of which is 6,812 ft; but on this section is found the steepest short gradient, the descent being made at an average of 1 in 31½, but with a short bank of about three-quarters of a mile at approximately 1 in 23. When the line was first opened engines weighing about eight tons were used, capable of hauling a load of ten tons up the maximum gradients of 1 in 19 and round the sharpest curves. But when the banks were reduced, more powerful locomotives were put into service. These weighed twelve tons and could haul twenty-seven tons up gradients of 1 in 25. The next step was the introduction of locomotives weighing fourteen tons and capable of hauling fifty tons up a similar bank. At the time of writing there are twenty-seven engines of the fourteen tons type, one weighing twelve tons, and one weighing twenty-eight tons. There are two rail motors which seat fourteen passengers. The rolling-stock is necessarily on a small scale. First-class carriages are 13 ft long, 6 ft wide, and 7½ ft from rail level to roof. They are fitted with 19½-in wheels, and the floor is set very low. There are also open trollies, fitted with hoods and curtains for protection against bad weather. Baggage and goods are carried in covered trucks. The maximum speeds going up are twelve miles an hour, and nine miles an hour descending. At one time tea was the principal commodity carried, but cereals now take pride of place. In the year ended March 31, 1934, the tonnage of goods totalled nearly 80,000, rice accounting for nearly 20,000 tons of this. ROUNDING “AGONY POINT”. A train on a remarkable section of the Darjeeling Himalayan Railway. 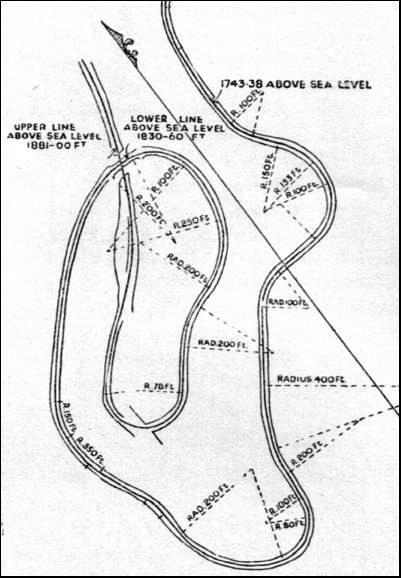 The upper part of the loop - the fourth on the line - was originally a curve of 59½ ft radius. Improvements have been made, but this loop is still known as “Agony Point”, where trains almost overhang the hillside. You can read more on “Burma’s Metre Gauge System”, “Hill Lines of India” and “Modern Transport in India” on this website.